The Annual Meeting will be held at the Bagley Club at 7 p.m. on 29th January 2016 where the existing officers are standing again apart from the Welfare Officer, where there is a vacancy. Clubs may have more than one team in the Shropshire League - proposed by Bayston Hill and seconded by Meole Brace. Revisit last year's proposal 'Any player playing for a team in the Shropshire Divisions, may play for that or any other in the Shrewsbury Divisions – proposed by Minsterley and seconded by Graeme Wornell (Vice Chairman). A change in the promotion and relegation structure to two up, two down, rather than the current structure of three up/three down (prize money to remain the same) – proposed by Corbet Arms and seconded by Reman Services. A change in the structure for the Shropshire Divisions to 10 aside instead of 12 aside and the Shrewsbury Divisions changed to 12 aside from 10 aside - proposed by Corbet Arms and seconded by Reman Services. A player may play for one club in the Shrewsbury Divisions on a Tuesday and a different Club in the Shropshire Divisions on a Friday – proposed by Minsterley and seconded by Graeme Wornell (Vice Chairman). A change in the promotion and relegation structure to two up, two down, rather than the current structure of three up/three down – proposed by Corbet Arms and seconded by Reman Services. A change in the structure for the Shropshire Divisions to 10 aside instead of 12 aside and the Shrewsbury Divisions changed to 12 aside from 10 aside - – proposed by Corbet Arms and seconded by Reman Services. 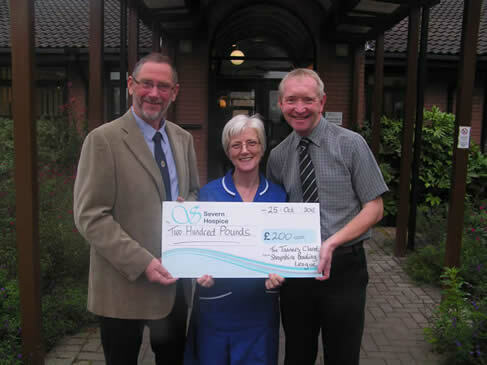 The Tanners Claret Shropshire Bowling League have presented a cheque to the Severn Hospice for £520, which was raised on the charity day at the end of September. 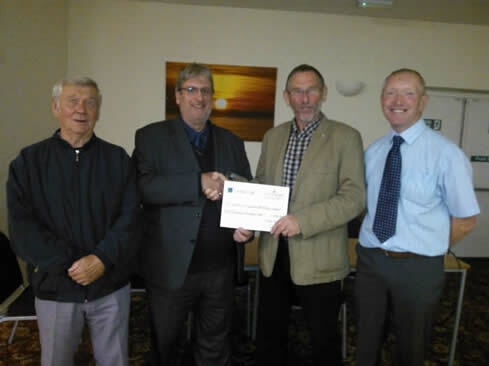 The money was donated by prizewinners giving their money back, donations from bowling clubs and from raffles on the day. Pictured are: (L to R) Barry Jennings (Competition Secretary), Andy Price (Secretary), Mike Perry (Severn Hospice), Rob Jones (Charity Competition Sponsor) and Paul Adams (League Treasurer). Wayne Phillips of Hanwood won the Terry Croft Champion of Champions Trophy held at Reman Services Bowling Club on Sunday. In the final he beat Pete Mackay of Greenfields Social 21-16. In the first round he beat Keith Wall (Telepost) 21-14, then Tony Parsons (Prince Social) by the same score before beating Elephant & Castle's Richard Leah 21-15 in the semi final. Pete's road to the final saw him first beating Andy Price (Pontesbury) 21-13, then Elephant & Castle's Dave Hanson 21-17 and Bricklayer's Perry Evans 21-8 in the semi final. Pictured above are the two finalists, Wayne Phillips and Pete Mackay, the late Terry Croft's daughter and wife, Alison Hodkinson and Pat Croft, and Competitions' Secretary, Barry Jennings. All clubs or players who are holding league trophies are requested to take them to the Shropshire Trophy Centre as soon as possible so that they can be engraved for the Presentation Evening on 24th October. Hanwood, having beaten Hanmer and Donnington Wood on their way to the Premier League Play Off Final, had a great win on Friday night at Allscott. In front of a large crowd they beat Archibald Worthington by a convincing 46 chalks and will retake their place in the Premier League next season. OSBC B 4 (170) Pontesbury A (189) Well done to Pontesbury on clinching the first division title after this great away win at Old Shrewsbury where Dave Povey had a brilliant 21-4 card to put the result beyond doubt. Rich Jones won 21-9 for the hosts. Bayston Hill 8 (180) Crescent 6 (161) A battling performance between these two teams with the Hillbillies having a key card of 21-2 from John Davies. Crescent’s best was the ever consistent Mark Harris 21-8. POWBC C 8 (188) Hanwood A 4 (160) It was also 8-4 on the Hump as the POW won by a comfortable 28 chalks, Shaun Walker 21-8. Best of the four Hanwood winners was Martin Pover with a card of 21-12. Pontesbury B 10 (202) Battlefield A 2 (143) A big win for Pontesbury B which keeps them up, the Lions having just the two winners, Alan Hartshorne 21-16 and Jim Evans 21-18. The home coppers went to Dan Jones for his win of 21-8 whilst Tony Dodd and Kevin Jones both won 21-9. Unison A 7 (188) Prince Hotel 5 (165) A good contest by the Shirehall with games shared and Unison taking the match points by 23 chalks, Les Jones a 21-8 winner for them. Conrad Clapham returning to an old hunting ground won 21-11 for the Prince but ultimately this result did neither side any favours as unison are relegated and the Prince look to settle for runners up. St Julians 5 (166) Telepost A 7 (186) It’s been a tough season for bottom of the table St Julians and they closed their home programme with this defeat against Telepost as Mick Pritchard returned a fine 21-8 for the visitors. Mark Lanning was an early winner for the Saints with 21-12. Prince Social 4 (148) Castlefields B 8 (178) Castlefields B stay on course for a promotion place with this vital away win at the Prince with Mark Rogers 21-8 and Peter Thomas 21-9. For the now safe hosts Bob Pugh trundled in 21-10. Castlefields C 4 (156) Oxon Village 8 (171) Whilst the B’s are looking up the Castlefields C side looks like going the opposite way as they lost at home to Oxon Village. 21-7 from Mark Walker and 21-8 from Ade Clarke were cancelled out by the visitors Brian Selley 21-4, Mal Isaac 21-7 and Roger Lem 21-6. Reman Services 10 (201) Corbet Arms 2 (133)Reman Services needed this big win to stay in third place as both that spot and the third relegation place will be decided after the final game. For Corbet who are now a point from safety Nick Marshall won 21-16 and Mike Wood 21-17. There was a share of the home sweep with Phil Davies and Graham Hughes both winning 21-5 and Bob Chatham 21-6. Oxon 7 (170) Bicton 5 (160)Games shared at the Grapes with promotion bound Bicton having a 21-2 from Paul Ashworth. Best for the home team were Martin McKinley and Danny Powell with 21-6s. Bricklayers B 9 (185) Meole Village 3 (152) Comfortable win for the Brick B although the Village picked up three useful points to keep them out of a relegation place. Perry Evans 21-4, Sean Lane 21-8 and Stephen Jennings 21-9 for the Brick and John Cooper best for the Meole with 21-10. Battlefield B 4 (162) Bricklayers A 8 (180) The Division’s champions won again as Tim Norman confirmed their 21st victory of the season with 21-9, although Dave Cadwallader bettered this with 21-7. Crescent B 3 (166) Reman Sentinel 9 (192) Crescent B look doomed as Daisy’s troops had just the three winners, Simon Hepworth best of these with 21-13. The Sentinel replied with a 21-10 from James Mammone. Dorrington 9 (183) POWBC A 3 (129) Third placed Dorrington had two big cards of 21-1 from Gordon Cooke and 21-2 from John Childs whilst the POW replied with Tom Moseley 21-7. Meole Brace C 4 (157) Pontesbury D 8 (159) This result confirmed Meole’s relegation but the Pontesbury D team still have a mathematical chance of staying up after this away win. Margaret Tudor 21-4 and Cliff Evans 21-5 helped set up the win as Bob Plimmer 21-6 and Derek Jones 21-7 replied for Meole. Pontesbury C 8 (190) POWBC B 4 (157) A win for Pontesbury C but not enough to stave off relegation. David Charles won 21-6 and Ray Perry 21-8 for the village side and John Evans won 21-11 for the Humpers. Greenfields Social A 9 (200) OSBC A 3 (129) The ‘fielders gained promotion in fine fashion with Roger Jones 21-2, Chris Jones 21-6, Ian Kilburn 21-7 and George Jones 21-9. For mid table Old Shrewsbury Mark Preece won 21-16. Meole Brace B 4 (165) Bagley A 8 (166) Both these teams sit just outside the final promotion place and this was a great match with Bagley winning by a chalk. Both sides had a 21-3 card with Meole’s Ian Riddell and Bagley’s Gary Morgan obliging. Bicton Village 10 (191) Unison B 2 (155) This result should keep Bicton Village up and there matching best cards in this game as well with Paul Idris Evans winning 21-6 for the hosts and Bill Moseley for Unison. There has been a very good response for tickets for the League Presnetation Night at Bagley BC on Saturday 24th October. So far 103 tickets have been sold and there are seventeen remain which are available on a first come, first served basis from League Secretary Andy Price. The Tanners Wines Shropshire League Charity competition was played on Sunday 27th September at the Severnside complex with the finals at Telepost. The fours sides who contested the semi finals were Unison who beat Pontesbury 61-60, in a very close encounter as the score suggests, Scott Moseley pulling out a classic 21-7 at the end. The other game was just as close between Hanwood and Prince Hotel, Hanwood winning 78-76. The League wishes to thank Rob Jones of Telepost Bowling Club for his sponsorship, people and clubs who made donations, the generosity of all who took part in various raffles throughout the season and to the venues for the use of their facilities. Competitons Secretary, Barry Jennings, said I am proud to say that every team that collected their prize money gave it back to swell the charity fund to over £500, which will go to our chosen charity for 2015. Unison's Cameron Griffin, Scott Moseley, Will Tyler and Prince Hotel's Darren Powis, Barry Jennings, Hanwood's Mark Shore, Danny Wornell, Martin Middleton (Meole Brace) and Conrad Clapham (Prince Hotel). This one day competition, kindly sponsored by Rob Jones, will be held on Sunday 27th September at 10.30 a.m. The qualifying group games will be played at the Severnside Complex with the semis and final at Telepost. The Frank and Mabel Edwards Mixed Doubles competition played on a suberb green and venue at Old Shrewsbury on Sunday 13th September was won by Lisa Neal (Oxon) and Mike Beer (Battlefield) who beat last year's winners Emily Cunningham (POWBC) and Keith Wall (Telepost) 21-9 in an excellent final. There were ten competiting pairs and all games were played to a high standard, taking between 24 and 31 ends. The losing semi finalists were Anna Preece (OSBC)/Darren Powis (Prince Hotel) and Ann Parrish/Tony Cunningham (POWBC). 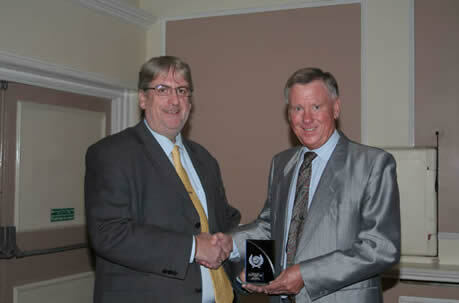 Neil Jones of sponsors Haughton Services presented the prizes. Battlefield won the Tanner Cup for the seventh time when they beat Hanwood by a comfortable 35 chalks at Reman Services. The Lions went for it at the start with Michael Beer first off 21-8 and were followed by Keith Owen 21-12 and Kevin Perks 21-14. Wayne Phillips was the only Hanwood success with 21-16 as Battlefield went 24 up. Man of the Match, Dave Beer at No. 5 continued the momentum with a classy 21-10, excelling in the corners. Danny Wornell was the only Hanwood winner in the middle with 21-14 as the Lions increased their lead to 34. Andy Jones got off to a flyer at No. 9, eventually winning 21-10 to confirm the victory. Hanwood's back pair of Phil Lyttle and Phil Price won 21-10 and 21-19 respectively. The Prince B team beat their A team by 37 chalks in the final of the Team Doubles competition held on Severnside No.1 with their top pairs being Katie Barnes-Smith/Conrad Clapham 21-6, Paul Marshall/Danny Wornell 21-8 and Matt Cooke/Darren Powis 21-9. The A team had just the one winning pair in Geoff Davies and Bob Pugh 21-8. In the Consolation held at Old Shrewsbury, Oxon/St Julians beat Meole Brace by 19 chalks, Chris Kershaw and Ted Rogers 21-8 winners. For the Bracers Eric Greaves/Tony Williams and Neil Picken and Mike Jones both won 21-18. The final of the Tanner Cup between Battlefield and Hanwood will be played at 7 p.m. on Saturday 12th September at Reman Services. Report on the Tanners Wines League Champagne Cup Final played on Saturday 5th September between the Prince of Wales Hotel and Unison. The match was played in the true spirit of the game, competitive but fair and friendly throughout. Prince Hotel having 8 winners - Mike Hughes 21-9, Darren Powis 21-17, Kelvin Holder 21-10, Conrad Clapham 21-19, Ian Smith 21-9, Matt Cooke 21-17, Jack Dale 21-15 and Dave Pugh 21-18. 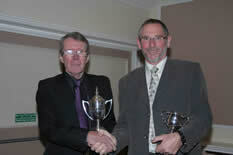 Unisons four winners were Brian Meredith 21-18, Dominic Wooton 21-3, Alan Everall 21-9 and Simon Reynolds 21-12. The Prince of Wales Hotel won by 210 to 198 and the prizes were presented by Mr Steve Lloyd who was representing Tanners Wines Merchants who have sponsored the Tanners Shropshire Bowling League for over a quarter of a century, Steve walked on to the green to a rousing welcome. The last prize to be presented was the man of the match award. There were several players in contention - for the Prince Conrad Clapham who had the game of the night beating Clive Jordan 21-19 and Ian Smith winning 21-9. For Unison Dominic Wooton 21-3 and Simon Reynolds 21-12. The prize went to Dominic who kept his team in the match with a crucial 21-3 win at number 5. 2006 Tanner Cup winners Battlefield booked their place in this year's final with a comfortable win over Ludlow Castle. A 21-9 card from Richard Lane was cancelled out by Sam Cartwright's 21-8 at the front and when Barry Gilder came off 21-3 in middle, Battlefield were firmly in control. Dave Wilding threatened a Castle recovery with 21-7 but this was tempered by a 21-8 from Kevin Perks. The other semi final between two teams who have never won the cup was between Hanwood and Bricklayers with the former winning by 17 chalks after a close battle. After the front four there were just three chalks in it and after eight, only five chalks. A 21-9 win for the Brick's John Dorsett in the middle was countered by Dave Payne 21-13 and Carl Bowers matched this for Hanwood at No. 9. A 21-12 win for Phil Price sealed the win. The final will be played on Saturday 12th September. 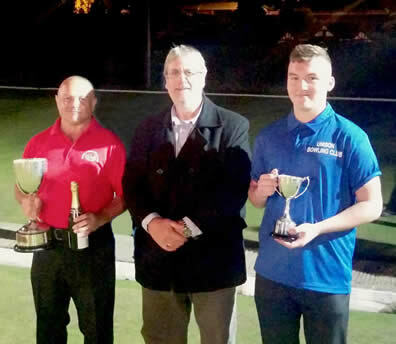 Ash Wellings of Hanwood was the winner of the 2015 League Handicap held at Severnside Bowling Club on Bank Holiday Monday. In the final he beat Jon Mansell of Old Shrewsbury 21-17 having overcome Ludlow Castle's Simon Lane 21-17 in the semi final. In the other semi final Geoff Davies of Prince Hotel dipped out 21-15. There were 34 entries in the competition which was kindly sponsored by Bluebird Care. The finals of the Team Doubles competition will be held on Thursday 10th September with Prince Hotel and Social A playing their B team on Severnside No. 1 in the main competition and Meole Brace v. St. Julians/Oxon in the Consolation at Old Shrewsbury. Crescent won the Fullwood Cup for the first time beating Hanwood 6-4 in a match they always looked to be in control of. They almost had a 3-1 lead off the front but a remarkable comeback by Ben Talbot from 20-9 down to win 21-20 made it 2-2. The middle was a tight affair with Crescent taking an 18 and 19 winner, whilst Hanwood also had a 19 winner. Man of the Match, Lee Walmsley, wasted no time at No. 9 coming off 21-4 to make the score 5-3 and 26 up on the aggregate. Mark Jenks then came off from game No. 8 with a 21-16 card and the Cup was won. Best score for Hanwood came from Phil Lyttle at the front, 21-16. The final of the Champagne Cup will be played on Severnside No. 3 at 7 p.m. on Saturday 5th September between Prince Hotel and Unison. The final round of the Team Doubles competition takes place on Thursday 27th August. The League Handicap will be held at Severnside Bowling Club on Monday 31st Augiust. Refreshments will be available from 10 a.m. and check in is no later than 10.30 a.m. with a start time of 10.45 a.m. Sponsored by Bluebird Care, entry is free and a new handicapping system will be in place with handicaps ranging from Owe 2 to Receive 4. These will be allocated according to respective divisions. This one day competition, kindly sponsored by Rob Jones, will be held on Sunday 27th September on qualifying greens around Shrewsbury with the finals at Telepost. The final of the Champagne Cup to be played on Saturday 5th September will be between Prince Hotel and Unison. Unison were comfortable 52 chalk winners over Prince Social at Telepost, despite a fine 21-7 from the Prince's Phil Thomas. Les Jones 21-5 and Clive Jordan 21-9 showed all their experience for the Shirehall side. Unison led by 17 off the front but after the middle the margin was a formidable 40 chalks. The game of the night saw Will Tyler making an excellent comeback to beat Christie Hughes 21-15. 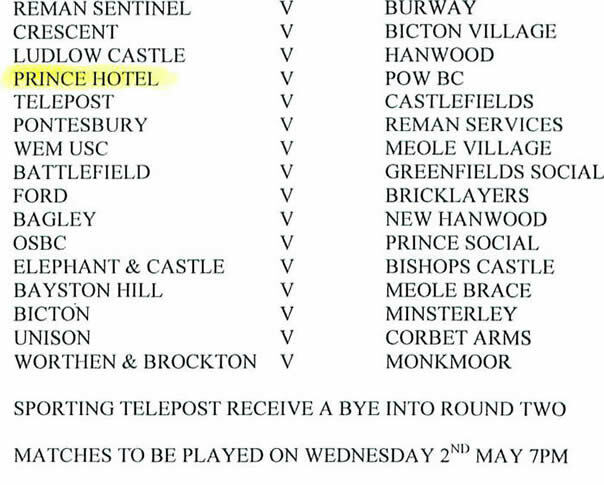 The other semi final was played at Bicton between Prince Hotel and Crescent, with the Prince winning by 21 chalks. They built up a 16 chalk lead off the front with Darren Powis winning 21-9 but it could have been more had it not been for a great comeback from Mark Harris who trailed 13-0 at one stage but brought his game back to 19-18 down, before Tracy Ryan ran out. Crescent's Scott Bowen then put in a real Captain's performance to win 21-11 but the Prince held the middle and increased their lead by a chalk. It was a similar story at the back with the Prince adding a further 4 chalks to the aggregate despite a fine performance from Lee Walmsley at No. 12 winning 21-14. The venue for the Tanner Cup Semi Final between Bricklayers and Hanwood is now St Julians. Match to be played Wednesday 2nd September. The Scadding Cup was presented by Mrs Peg Scadding at the final held on Saturday 15th August on Meole Brace No. 1 Green between Bricklayers B and Pontesbury A. 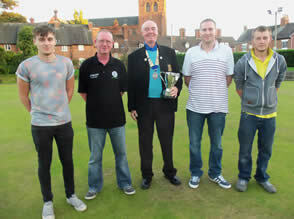 The green was immaculate and Meole Brace Bowling Club did the League proud, said Competitions Secretary Barry Jennings. Referee was Roger Griffin and Measurer Mike Caddick. Pontesbury started off at a fast pace with Anthony Price 21-7 and 'Red Eye' Emyln Jones 21-6 to go 3-1 up. The Brick were not for lying down and after eight games were 5-3 up with fine wins from the Cranes, Neil 21-9 and Oliver 21-15. More suspense followed with Andy Price winning at No.9 and Dave Povery at No. 10 for Pontesbury. Dave playing very well to win 21-8 and Andy Price and Barry Davies battling out a classic game, indeed both players were at the top of their games, Andy eventually winning 21-18 to make the final score 5-5 and Pontesbury winning the match overall by 27 chalks. The next round of the Team Doubles competition will be held on Thursday 27th August. There is a change of venue for the Scadding Cup Final due to the current circumstances at Greenfields where they are unable to host this year's final. The match will now be played on the Meole Brace No. 1 green on Saturday 15th August with a 7 p.m. start. Competitions Secretary, Barry Jennings, was at Reman to officiate the OSBC B v. Crescent A semi final and he said it was one of the best and thrilling games he had seen for a long time. OSBC went 4-1 up, then 5-3 up and +6 on the aggregate. There then followed two great cards from Dave Oliver 21-17 and Lee Walmsley 21-16 who came back from 9-1 down and 13-6 down respectively to secure the win for Crescent by three chalks, with games tied at 5-5. Mike Caddick officiated the Hanwood A v. St. Julians at Bicton where it was more straight forward with Hanwood winning 7-3. They had cards of 21-5 from Phil Price and 21-7 from Ben Talbot whilst best for St Julians was Andy Reynolds 21-12. The final will be held on the Fullwood Green (SSBC No. 3) on Saturday 29th August. The next round of the Team Doubles competition will be held on Thursday 13th August. Meole Brace have a bye. The Terry and June Sambrook Doubles competition, although played in appaling conditions, had a great entry of 19 pairs. After eight hours of bowling, the final was contended by the 2014 winners, Tony Parsons (Prince Social) and DannyWornell (Hanwood) and Perry Evans and Nigel Thomas from the Bricklayers. The eventual winners were Tony and Danny, winning 21-16. Competitions Secretary, Barry Jennings, said congratulations must go to the Prince Hotel where the green and hospitality were great despite the weather. He also said the Tanners Claret Shropshire Bowling League would like to thank Mr Glyn Harvey for his kind sponsorship of the competition. 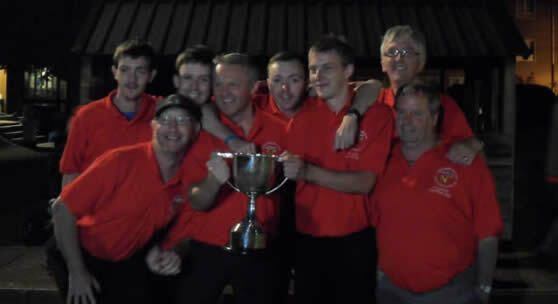 Pictured left are winners Danny Wornell and Tony Parsons with Barry Jennings and on the right Perry Evans and Nigel Thomas. Pontesbury A were 8-2 winners in the semi final against Corbet Arms with Steve Williams best of three winners in the middle with 21-8. The Nags Head team led 3-1 off the front with Mike Wood the sole Corbet winner with 21-20. Carol Jones went one better for the Corbet with a 21-19 card. In the other semi final Bricklayers won 6-4 having gone 4-0 up on the front, Neil Ashton 21-4, Perry Evans and Derek Hill 21-5 and Stephen Jennings 21-7. Nigel Thomas then won 21-7 at No. 5 before Dorrington took 4 of the last 5 games, Peter Smith 21-5 and John Childs 21-9 last pair on. The Management Committee of the former Ford Bowling Club are trying to contact as many past members as possible with a view to running a competition celebrate the life of the club and to honour their past Presidents and current President - Chris Kelly. Could any former bowlers please contact Andy Jones on 07777 653538, Gary Middleton on 07964 834319 or Julie Pearce on 07890 316729 before 2nd August for further information. This year's competition will be played on a Round Robin basis as there are only seven entries. The winners of each group will play the main final and the runners up the consolation final. The Terry and June Sambrook Doubles competition will be played on Sunday 26th July and entries to Barry Jennings should be submitted by 12 July. Six teams have entered the Team Doubles competition and two more teams are still needed. The first round will be played on 23rd July. Entries to Competitions Secretary, Barry Jennings (01743 351155). Clubs can join together to make a side and the entries for 2015 include teams from Bicton/Bicton Village, Oxon/Severnside St Julians, Prince Hotel/Social and Pontesbury/Severnside. The other entry is from Old Shrewsbury. Prince Social's Rhys Marshall and Susie Lawson were the Youth Doubles winners beating Pontesbury's Kelly Price and Charlie Hotchkiss 21-20 in the final. Competition Secretary Barry Jennings said "Some of the ends in the final were unbelievable for kids with four bowls within a foot of the jack". The Youth Doubles takes place at Severnside on Thursday 25th June and Competitions Secretary, Barry Jennings, will take entries on the day up until 6.45 p.m. The 1st Round of the Team Doubles competition due to be played on 2nd July has been put back to Thursday 23rd July as there are only five entries at present. A minimum of eight teams are required to make the competition viable and clubs are requested to contact Barry Jennings (01743 351155) to enter. Teams may comprise members of just one club or and amalgamation of more than one club. Draw carried out by Mrs Handsworth, Dorset. The Tanners Shropshire Bowling League had a very enjoyable day in the Inter League Competition played in North Shropshire, reaching the final and losing by just three chalks to the Wem & District Bowling League. They overcame Shropshire Ladies and Whitchurch B in the Group stages. Against the Ladies they won by a 20 chalk margin despite having to concede a game due to ‘navigational problems’ as one player got lost! Mike Hughes (Prince Hotel) was the best winner with 21-10. In the second match Dan Williams (Crescent) won 21-7 and Wayne Phillips (Hanwood) 21-9 as they beat a young Whitchurch B side by 44 chalks. They then moved to Prees where they beat Market Drayton Seniors by five chalks in the semi-final, Tim Jordan (Unison) winning 21-12. The final saw some very close matches with the Tanners team having a 20 loser, four 19 losers and an 18 loser. The two winners were Will Tyler (Unison) and a Captain’s performance from Geoff Davies (Prince Hotel) 21-14. 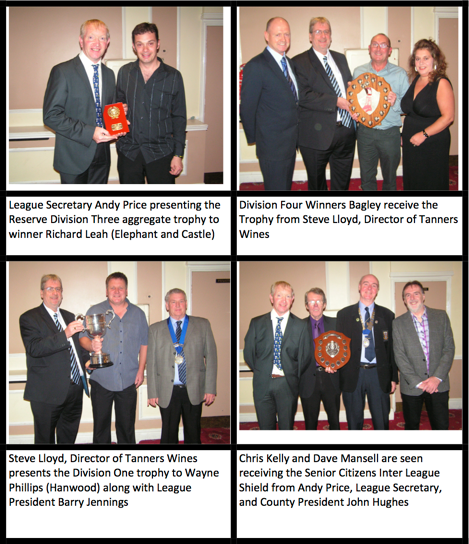 After the competition League Secretary, Andy Price, said “Thank you to all the Tanners players who turned up to play for the Tanners League in the Senior Inter League Competition on Saturday 13th June. They were captained by Geoff Davies who led his team to the Final, sadly just losing out to the Wem League. We are grateful to the players who played, some of them at the last minute. I hope they enjoyed their day. Well done to everybody”. Hanwood beat Pontesbury by 58 in the quarter finals of the Tanner Cup and will be joined in the semi finals by Ludlow Castle who beat Meole Brace by 54, Battlefield who beat Castlefields by 38 and Bricklayers who beat Bicton by 40. In the quarter finals of the Champagne Cup Crescent beat Old Shrewsbury, Prince Hotel beat Reman Services by 15, Prince Social beat Meole Village by 78 and Unison beat Monkmoor. Entries are invited for young bowlers under 18 on 1st January 2015 to Barry Jennings. The competition will be played at Severnside on Thursday 25th June, commencing at 7 p.m. The competition is kindly sponsored by League Vice President, Mike Caddick, and is free to enter. The first round of the Team Doubles competition will be held on Thursday 2nd July. The competition is open to all teams in the Tanners League and clubs may, if they wish, join together with another club to make a team up. Entries to Barry Jennings. The Terry and June Sambrook doubles competition, kindly sponsored by League Vice President, Glyn Harvey, will be held on Sunday 26th July, starting at 10.30 a.m. Qualifying games to be played on various greens in the local area and finals at the Prince Hotel BC. Entry £5 per pair to Barry Jennings by 12th July. Entries are invited from registered bowkers with the Tanners Shropshire Bowling League for the Bluebird Care League Handicap competition. The competition will be played on Monday 31st August commencing at 10.45 a.m. All players must report to Severnside BC before 10.30 a.m. Entry is free and there will be a new handicapping system in place with handicaps ranginf grom owe2 to receive4 and these will be allocated according to respective divisions. Entries to Barry Jennings. The Frank and Mabel Edwards mixed doubles competition will be held at Old Shrewsbury BC on Sunday 13th September at 10 a.m. (closing dates for entries to Barry Jennings is 30th August). Entry fee is £5 per pair. The Charity One Day Competition kindly sponsored by Rob Jones will be held on Sunday 27th September. Qualifying groups on greens in the Shrewsbury Town Centre area and finals at Telepost. Entry fee is £5 per team and competition is only open to players registered with the Tanners Shropshire Bowling League. Closing date for entry is 14th September. Teams should consist of 5 playerd with 4 playing in each game. Handicapping will be in place. 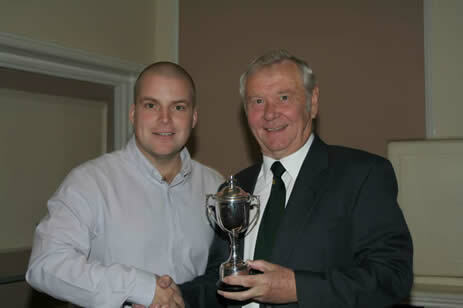 Keith Wall (Telepost) won the League Merit beating Castlefields' Daryl Edwards 21-17 in the final held at Severnside. There were 42 entrants and in the Semi Finals Keith beat Pontesbury's Rob Jones 21-15 and Daryl beat clubmate Russell Pugh 21-10. Hanwood B, Bagley B, Monkmoor B, Telepost B, Bicton Village, Unison B, Pontesbury A, Pontesbury D, Dorrington, Corbet Arms, OSBC A, Meole Village and Meole Brace B. Could all clubs please note that Sporting Telepost only withdrew from Shropshire Division 4 (Friday team), they continue to play as Telepost B in Shrewsbury Division 4 as reported at the last League Executive meeting and all clubs need to follow the fixtures accordingly. Could all clubs visiting Pontesbury BC on Fridays in Shropshire Division 1 please park at the new green on the other side of the road as the pub is very busy and needs as much parking as possible. Due to a refurbishment at the Grapes Inn the pub will be closed for a few weeks ,so any teams that are due to play Oxon/Oxon Village between 4th May 2015 and 9th June 2015 please note there will be no facilities for drinks or food during that period, so please feel free to bring your own drinks and refreshments during the pub closure. Natalia Connor from Meole Brace BC retained the Harold Kaye Trophy after winning 21-9 against Aaron Sutherland from Bagley. Semif finalists were Harry Parsonage (Burway) and Cerys Marshall (Prince Hotel). They are pictured below with sponsor, Mike Caddick. It is with great regret that Ford Bowling Club have had to withdraw from the Tanners Claret Shropshire Bowling League with immediate effect. Having being unable to fulfill the financial requirement of the proprietors and consequently losing a number of players, Ford are no longer in a position to use the green and so will be winding up in the next few weeks. This is a very sad time for all concerned with Ford Bowling Club but it does give current players the chance to relocate if that is their wish. On a personal note I would like to thank all bowling friends for their support and we will see you all around the greens.Where Ford appears on any fixtures in all divisions, this will become a Bye. Two late withdrawals were announced at the March Executive meeting with Sporting Telepost, who had only just joined the Friday night league, withdrawing from the Shropshire Fourth Division. At the other end of the scale, Ford B, a long standing team have withdrawn from Shrewsbury Division Three. The draws for the Tanner and Fullwood Cups have been made with some very interesting ties, including last season's Tanners Cup finalists, Telepost and Prince Hotel, drawing each other and the same scenario with the Champagne Cup finalists as Bricklayers play Unison. There is also an all First Division clash between Ford and Battlefield. In the Fullwood Cup last season's winners Hanwood A have drawn their B side. There are also two other 'inter-club' ties for Unison A & B and Telepost A & B. Crescent A, having won the Scadding Cup for the past two seasons, face a tough tie in the 1st Round of the Fullwood Cup to Pontesbury A. It was announced at the February League Executive Meeting that the Shropshire Divisions would start a week earlier than previously agreed. This is necessary to ensure compatability with the Premier League fixtures. Consequently the season will start on Friday 17th April 2015. The full fixture list for both the Shropshire and Shrewsbury Divisions can be found under the 'Current Season' tab - click on Tanner Shriopshire link. At the AGM it was agreed to remove the requirement for teams in the Shropshire League to have a Registered 6. Clubs playing in the Premier League will have to register 12 players who will not be eligible to play in the Shropshire League. The rule change was carried with 36 votes in favour and 7 against. The proposal from Bayston Hill and seconded by Meole Brace that players can play for one club in the Shropshire Divisions and a different one in the Shrewsbury Divisions was lost as there was not the required two thirds majority (26 voted in favour and 19 against). The admission of three new teams to the Shropshire Divisions (Monkmoor, Sporting Telepost and Lythwood) makes 45 teams in total. Two formats were put forward - 3 divisions of 15 or 4 divisions split 12:11:11:11. The latter format received a large majority of the votes. The Shrewsbury Divisions will commence on Tuesday 7 April (Division 4 on 21 April) and the Shropshire Divisions on Friday 24 April (subsequently changed to 17 April). The Annual General Meeting of the League will be held at 7 p.m. on Friday 30th January at the Bagley Bowling Club. There are two Rule changes being put forward. The first, proposed by Bayston Hill and seconded by Meole Brace, is "Any bowler playing for a team in the Shropshire League may play for that or any other team in the Shrewsbury League". The second is proposed by the Management Committe and seconded by the Executive Committee and reads "Clubs playing in the Shropshire League no longer will have to register six players". There are three new applicants to the Shropshire League - . The Annual Dinner and Presentation Evening was held on Saturday 25th October and pictured below are members of the Crescent A with League Chairman Mike Caddick and the Scadding Cup, which they won for the second successive year. Telepost won the Charity Fours on Sunday winning by three chalks against Prince Hotel A in the final. The two other semi finalists were Hanwood and Prince Hotel B in a competition which saw fifteen entries and £250 raised for charity. The Telepost team are pictured on the left with Sponsor Rob Jones and League Chairman Mike Caddick and the Prince Hotel team are shown on the right. At Bicton: Ford, Reman, Prince Hotel A and St Oswalds. At Reman Services: Bricklayers B, Hanwood, Prince Ladies, & Telepost A. At Prince Hotel: Bicton, Bricklayers A, Minsterley and Telepost B. At Meole Brace (green to be confirmed): Atcham, Church, Prince Hotel B + vacancy. Telepost's Keith Wall won the Terry Croft Champion of Champions competition held on the Reman Services green on Sunday 12th October, beating Ludlow Castle's Richard Lane 21-13 in the final. The two other semi finalists were Geoff Davies (Ford) and Bob Chatham (Reman Services). Any clubs with League Trophies are requested to take them to the Shropshire Trophy Centre as a matter of urgency please. 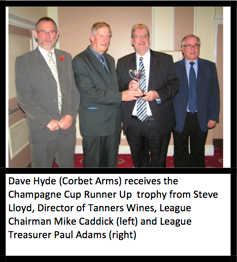 Steve Lloyd of League Sponsors Tanners Wines is pictured below with Dave Mansell of Telepost who won the Tanner Cup and Neil Jones of Bricklayers who won the Champagne Cup, pictured together with Andy Selley of finalists Old Shrewsbury with the Consolaton Cup. There will be two new names on the Frank and Mabel Edwards Trophy after Keith Wall (Telepost) and Emily Cunningham (Elephant & Castle) beat Frankwell pair, Angharad Jones and James Ashton, 21-18 in the final at Meole Brace. The semi finalist were Castlefields' Steph Clarke and Andy Duckett and the Prince's Ian Smith and Christie Hughes in a competition which saw fourteen entries and was sponsored by Haughton Services (Fencing Supplies). League Chairman and Match Referee Mike Caddick. Telepost won the Tanner Cup by one chalk against the Prince Hotel at Unison. Telepost were 18 up of the first four with Player of the Match, Shaun Bould winning 21-6, but the Prince took all four games in the middle to lead by 10 going into the back with Mike Hughes winning 21-10 and matching Clair Barker's card on the front. Keith Wall was first off at the back with a 21-7 win to set up the tightest of finishes with three games left on. In the event Simon Lewis held his nerve to win the crucial chalk. 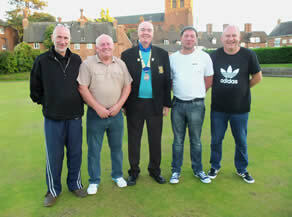 The Bricklayers won the Champagne Cup by beating Unison by 18 chalks (207-189) on Old Shrewsbury Number One. OSBC led by seven chalks off the front with Dominic Wootton winning 21-6 for Unison. A 21-7 from the Brick's Tony Williams in the middle helped give his side a five chalk lead going into the back, which then saw Sean Lane win 21-6 for the eventual winners and a 21-9 from Unison's Les Jones. The final of the Tanner Cup between Prince Hotel and Telepost will be held at Unison on Saturday 13 September (7 p.m. start). Prince Hotel and Telepost were the two winning semi finalists in the Tanner Cup. The Prince beat Hanwood by a single chalk at Telepost. Both sides had a 21-8 winner from Ian Payne and Phil Talbot. In the other semi final, played at St Julians, Telepost comfortably beat Ludlow Castle by 44 with Gary and Keith Wall both winning 21-9. Best for the Castle was Tom Harrington with 21-14. The final of the Tanner Cup will take place on Saturday 13th September, venue to be confirmed. Competitions Secretary, Barry Jennings, is proposing that the Charity Fours competition be played on Sunday 19th October (10 a.m.) start. The four a side competition is open to all Tanners League players and teams can include players from different sides. Before confirming the date Barry would like clubs to contact him to confirm their interest. Emails can be sent to this site or Barry can be contacted on 01743 351155. Hanwood were 6-4 winners of the Fullwood Cup as they beat Pontesbury (173-170). Man of the Match, Alan Potter, gave Pontesbury a great start as he won 21-8 and they went 2-0 up. However, it was all square after the first four and then Hanwood sealed the win with a clean sweep in the middle, Gareth Winebloom winning 21-9. The Bricklayers were five chalk winners against Old Shrewsbury in the Champagne Cup semi final, with Sean Lane winning 21-7. In the other semi final Unison beat Crescent by 15 chalks. Phil Tyler won 21-7 for the Shirehall side at the start and a fine 21-2 from Crescent's Mick Cutler at the back was not enough as Dave Renwick won 21-5. The Team Doubles Finals will be played on Thursday 28th August with Prince Hotel playing Severnside St Julians & Oxon on Meole Brace No. 1 and in the Consolation Castlefields playing Severnside & Pontesbury at Prince Hotel. CARE, who are a leading home care and live in care agency based in Bayston Hill. Entry WILL BE FREE and a new handicapping system will be in place with a range from owe 2 to receive 4 depending on the divisions competitors play in. The Charity Fours has been CANCELLED due to lack of entries. The Charity Fours are due to take place at Severnside on Sunday 17 August but only four teams have entered at this stage. The deadline for entries has been extended to Thursday 14th August. Entries should be made through Barry Jennings on 01743 351155. 10.15 a.m. for a 10.30 am start, finals at Telepost. The final of the Scadding Cup between Crescent A and Pontesbury B will be held on Greenfields No.1 on Saturday 16 August. The final of the Fullwood Cup will be played on the Fullwood Green (severnside 3) on Saturday 30 August. In the semi finals Pontesbury (181) beat POWBC (177) by 6 games to 4 at Telepost, Dave Povey winning 21-10 for the victors and Will Roberts 21-13 for the POW. It was level at 4-4 going into the last two games but Pontesbury came through with Brian Williams and Rob Jones both winning 21-16. It also finished 6-4 in the other semi final with Hanwood (186) overcoming Ford (137) at Old Shrewsbury No. 1. The big winners for Hanwood were Steve Price and James Mansell who both won 21-5. Best for Ford was Andy Price with 21-10. An excellent field of 28 pairs entered the Terry and June Sambrook Doubles where a new name was added to the cup in its 10th year after nearly twelve hours of bowling. Danny Wornell of Hanwood and Tony Parsons of Prince Social beat last year's winners, Geoff Davies and Chris Kelly of Ford in the final, 21-17. The semi finalists were Ian Marshall (Reman Sentinel) and Harry Ryder (OSBC) and POWBC pair, Doug Edwards and George Dourish. Winners Tony Parsons and Danny Wornell, pictured left with League Chairman and Final Referee, Mike Caddick, together with finalists Geoff Davies and Chris Kelly. The final of the Scadding club wil be played betwen last year's holders, Crescent A and Pontesbury B. The holders overcame the Bricklayers with a 7-3 win although it was tightnuntil the back when Crescent took the last two, with Lee Walmsley 21-9 after Mark Harris had won 21-4 at the front. The 'King', Derek Hill, gave the Brick an equally good start with 21-5 at the front. In the other semi final, Pontesbury B just won by six games to four. They did have four single figure winners so the aggregate would always have been safe, Kevin Williams best with 21-5. Best of the Castlefields B winners was Pete Thomas with 21-5. RAINBOW WARD. This includes an open bowling competition, which starts at 11 a.m. Entries by Friday (25th) to 01743 600297 or 01743 364139. The Fun Day will also include BBQ, Cream Teas, Ice Creams, Tom-Bola, Raffles for fabulous prizes. Fun and music quizzes, Bouncy Castle, Face Painting, Guess the Name of the Teddy, Find the Jack and much more family entertainment (all from 12 noon). The T & J Sambrook Doubles will take place at 10.30 a.m. on Sunday 27th July at the Prince Hotel Bowling club. 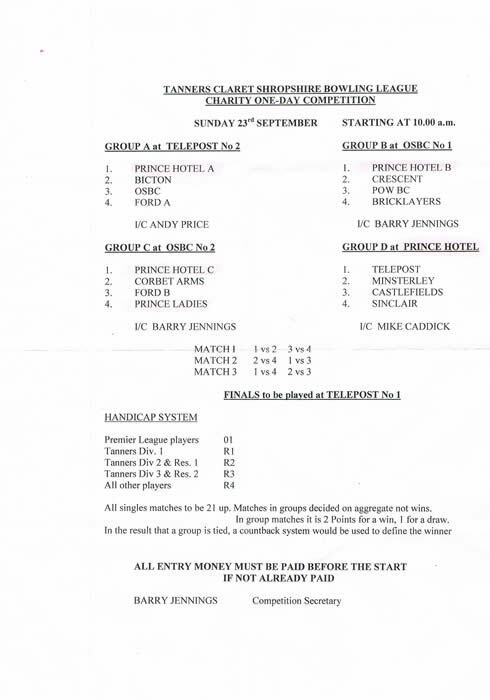 Entries on the day, email to information@shropshirebowlingleague.org or 07889 347373. Open to all Tanners League registered players. Pairs do not have to be from the same club. Entry fee - £5 per team. These games are still outstanding. Please rearrange as a matter of urgency. If these are not rearranged soon, the League will set a date. First Round winners go into Second Round of the main competition and losers go into First Round of Consolation. CARE, who are leading home care and live in care agency based in Bayston Hill. Entry WILL BE FREE and a new handicapping system will be in place with a range from owe 2 to receive 4 depending on the divisions comepetitors play in. The First Round will be played on Thursday 24 July. Steve Lloyd from League Sponsors, Tanners Wines, presents a cheque for £500 to League President Barry Jennings and Chairman, Mike Caddick. Ludlow Castle's Tom Harrington retained the Youth Doubles Trophy, this year being partnered by Telepost's Haydn Lewis. They were 21-9 winners in the final against Max Bennett (Reman Sentinel) and Mark Preece (OSBC). In the semi finals they beat Natalie Connor (Meole Brace) and Katie Barnes-Smith (Prince Social), whilst Max and Mark beat Ford pair Ben Middleton and Kelly Price. The Youth Doubles competitors pictured with League Secretary, Andy Price, and Steve Lloyd from League Sponsors, Tanners Wines. The First Round of the competition will be held on Thursday 24 July 2014. The League's Youth Doubles competition will be held at the Prince Hotel on Thursday 26th June. Entries will be accepted on the day by Competitions Secretary, Barry Jennings, up to 6.30 p.m. The competition is free to enter and is open to bowlers who were under 18 on the 1st January 2014. Closing date for the Team Doubles Competition is 25th June and all entries should be sent to Competitions Secretary, Barry Jennings, by that date . The 1st Round will be played on 3rd July. Teams can be combined between clubs if desired. The Tanners Shropshire League won the Shropshire Senior Inter League Championship on Saturday 7th June. Played around the Severnside Complex the Tanners team, pictured below, beat the Premier League by 23 chalks, having beaten Wem in the semi finals by 52. The League's last won this competition in 2011. League Secretary, Andy Price, has put out an urgent request for 3 ICs for the Senior Inter League matches which will be played on the Severnside Complex on Saturday 7 June. The ICs will just need to manage the games on the green during the group stages and keept the scores. Please contact Andy on 01743 851117 or send an email via the contact page on this website. The Tanners League have two Representative teams this year so any support will be very welcome. Entries are open for the Team Doubles Competition. The 1st Round will be played on 3rd July and entries should be sent to Competitions Secretary, Barry Jennings, as soon as possible. Teams can be combined between clubs if desired. No result sheet was received by Competitions Secretary, Barry Jennings, from Castlefields v. Meole Brace so a fine will be implemented. No result sheet was received by Competitions Secretary, Barry Jennings, from Bayston Hill v. OSBC so a fine will be implemented. Ford Bowling Club are pleased to announce that a ladies toilet has been installed at their green, this is in addition to the existing Portaloo. The On Line Results System is still not functioning but Mike Beckett has set up a temporary facility at http://www.mbeckett.co.uk/bowlingresults/index.htm whereby results can be entered. . As soon as the bowlingresults.co.uk becomes live any results entered will be transferred to that site. There has been a problem with the server that the On Line System uses. The issue causing the problem has been resolved and it should be up and running again in the next day or so. Individual club's logins will be temporarily suspended to ensure everything is working properly before any further results can be entered. Richard Lane of Ludlow Castle won the League Merit for the third time when he beat Doug Edwards of POWBC 21-14 in the final played on Severnside No. 3. In the semi finals he beat Keith Wall 21-18, whilst Trigger beat Graeme Wornel of Prince Hotel and last year's winner, 21-20. 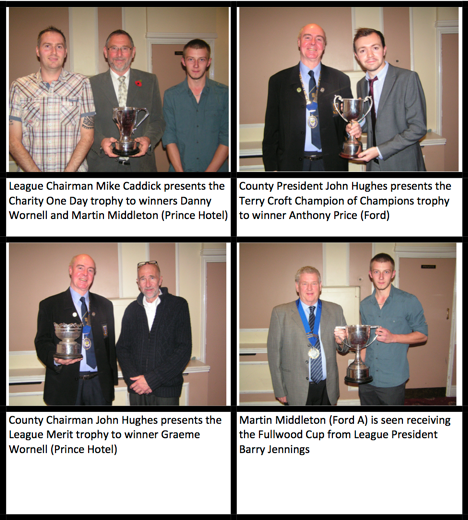 Pictured below are the four semi finalist, with Competitions Secretary, Barry Jennings. With regret the Ifton Bowling Club have resigned from the Shropshire League due to a shortage of players. Ifton were due to play in Shropshire Division Three. The League Merit takes place at Severnside on Monday 5th May at 11 a.m. The competition is open to all Tanners League registered players and entry is £3. Places can be booked on the day or by contacting Competitions Secretary, Barry Jennings, on 01743 351155. Natalie Connor was the winner of the Harold Kaye Trophy beating James Mansell 21-11 in the final played at Severnside. Camilla Parsonage and Kelly Price were the other two players to reach the semi-finals. Several clubs have not sent in their result sheets from last week's Fullwood Cup games and Competitions Secretary, Barry Jennings, has asked that they be sent in without further delay. In Division Four of the Shropshire League Severnside have taken up the fixtures left vacant by New Hanwood's late withdrawal but in Shrewsbury Division Four Dorrington B have had to withdraw due to a lack of players. The Junior Inter League competition was played on Saturday 12th April at Wem Sports and the Tanners League team were drawn in a group with Mid Shropshire, Ludlow and Whitchurch. The team beat Mid Shropshire and Ludlow in the group stages but lost to Whitchurch in final group game and finished runners up in the group. The Tanners team played Whitchurch A in the Consolation Final, but their opponents proved too strong. The side consisted of threee experienced bowlers in Natalie Connor, James Mansell & Callum Parsons and there were also some good performances by the newcomers, Rhys Marshall, Ben Middleton & Kelly Price. The Secretary would like to thank the six bowlers ( and supporters) who turned up early on a cold Saturday morning and were still going strong at 8.00pm in the evening. Also thanks go to Richard Jones and Gary Middleton for looking after the team all day. Front Tow - Kelly Price, Rhys Marshall and Ben Middleton. Last season’s champions got their season off to a near perfect start, dropping just the one chalk as Paul Caswell was the sole winner for the Corbet. Cliff Dickenson 21-5 and Tim Cliffe 21-9 best for the humpers. Games shared but the Sentinel took the aggregate by six chalks with Steve Maddocks winning 21-11 at the front for them. The Hotel had debutant Neil Ashley sharing their coppers with Kelvin Holder as they both won 21-12. Jon Oliver and Mark Harris won 21-8 for the visitors and Neil Harris added a 21-9 as the Crescent picked up four useful points at Pontesbury. A 21-7 from Antony Gray at the back ensured there would be no slip up by the Nags side. Meole took three games in the middle after the front had been shared to claim the win with their best card coming from Martin Jones with 21-11. The back was shared with Andy Price 21-7 for the Tractor Boys. Barry Gilder was first of the green with 21-9 and Harold Banks then matched this in the middle for the Lions. Telepost took a point at each stage with Rob Jones winning 21-7. Neil Beamond won 21-11 for Hanwood at the front but he was their only winners at that stage as Unison went 3-1 and 6-2 up with their coppers going to Simon Reynolds with a 21-5 card. These teams were two divisions apart last season and it was the relegated Reman Services who started the season with an away win. Scott Humphries 21-8 and Bob Chatman 21-9 had their big wins in the middle, whilst Rob Ashley was the Social’s best with 21-10. Games shared at each stage as Bicton took the match points by a comfortable 24 chalks. They had two single figure winners at the front to give them a useful cushion as Ken Barrow won 5 and Stuart Bennett 8. Battlefield’s Stacey Wenger replied with a 21-11 card. St Julians got their season off to a good start with this comprehensive home win although all players scored double figures for both teams. The home sweep went to Paul Brown with 21-13 at the front whilst Bayston Hill picked up their point from Nick Hughes 21-10 win at the back. Ford B went 3-1 up as Martin Ryan led the way with 21-6. Frankwell took two games 21-17 in the middle and a 21-6 from Richard Ewels. Oxon came out victors in this match as they took control early on, Dave Jones winning 21-5 to be best of three winners at the front. A 21-4 from Sue Storey threatened to bring the Village back into the match but in the end to no avail. Good opening win for Crescent B as they posted a first win of the season. Craig Charles and Alan Hotchkiss were 21-7 winners and Brian Richards added a 21-9. Pontesbury B took two points in the middle with Keith Tate winning 21-9. Both sides had single figure winners with George Spain 21-6 for the B team and Charlie Edwards 21-8 for the victorious Village side. The submitted result showed that the ‘El Classico’ ended in a draw all round with Tom Gregory 21-5 for the A Team and John Evans 21-10 for the Humpers B Team, both games played on the front four. Mal Wilde 21-2 and Dave Hanson and Emily Cunningham 21-7 were the three Shawbury winners, whilst Kevin Sudlow had a 21-4 win for the visitors. New Hanwood won the last two games with Martin Sandells 21-7. Bagley had gone 4-0 up at the start with Bob Bishop 21-4. Due to illness and work commitments the first Tuesday of the season crept up on Old Shrewsbury too soon but the two winners played very well with Cookie as the best winner 21—10. The Bricklayers lads found the green to their liking, especially Neil Ashton who won 21-5 and Simon Damm 21-8. Dorrington started well, dropping just the one chalk on the front with Chris Kershaw 21-7. Peter Smith then bettered this at the back with 21-6. The Social shared the middle with Nigel Harris 21-14 and two 21-20 cards helped them to four useful points. Castlefields C came out on top in this inter-club clash with six winners, including Paul Morgan 21-11, and 22 on the aggregate. Best of the three Castlefields B winners was Carl Wear with 21-10. County Welfare Officer, Barry Jennings, has issued an urgent reminder and warning to all clubs in the county who have not yet submitted their Club Welfare Officer forms. If they are not received by 20th April then that club will not be permitted to play in any leagues or cup competitions. There are nine clubs from the Tanners League who have not yet sent their forms in and these are Bagley, Corbet Arms, Ford, Greenfields Social, Ifton, Minsterley, Oxon, POWBC and Severnside. If you are a member of any of these clubs please draw this item to the attention of the relevant officer(s). Please let's make sure all Tanners League comply with this requirement. Thank you for your assistance. Please go to www.bowlingresults.co.uk - click on the Tanners Shropshire option and then click on the 2014 Fixtures Tab at the top of the page. Clubs are reminded that the Welfare Officer forms need to be completed and returned, with in date Disclosure and Barring Service ( DBS) check, to Barry Jennings by no later than 1st April 2014. New Hanwood have withdrawn their team from the Fourth Division of the Shropshire League. They will, however, continue with their team on a Tuesday in Shrewsbury Division Three. There will be a presentation of the new on-line result recording system prior to tomorrow evening's meeting of the Executive Committee, on which all clubs are represented, at the Bagley Bowling Club. The presentation will start at 6.30 p.m.
Severnside and Severnside St Julians are both playing on the Number 2 green this season and, therefore, the Shrewsbury Division Two fixtures have had to be amended and can be viewed at www.bowlingresults.co.uk - click on the Tanners Shropshire option and then click on the 2014 Fixtures Tab at the top of the page. For the full list of fixtures for 2014 please visit www.bowlingresults.co.uk click on the Tanners Shropshire option and then click on the 2014 Fixtures Tab at the top of the page. Dorrington and Monkmoor have withdrawn from this league. New entrants are Atcham and Dorrington B.
Castlefields A and Severnside St Julians C have withdrawn. Castlefields B and C will both play in Division 3 and Telepost will not now be relegated from Division 1. At the League's Annual General Meeting held on 31 January 2014 it was agreed that it would no longer be necessary to have a team playing in the Friday Divisions to play in the Tuesday Divisions. The Tuesday Divisions, which were formally called 'Reserve Divisions', will in future be called the Shrewsbury Divisions. One other change was that any new teams applying to play on a Tuesday in the Shrewsbury Divisions must be located within a 10 mile radius of Shrewsbury. A proposal to remove the requirement for clubs to have a 'Registered Six' was defeated. This means that any club with a team in both the Friday and Tuesday Divisions must register six players who are not able to play on a Tuesday. The League's Executive Committee, which includes representatives of all clubs, will be meeting on Thursday 20 February 2014 to decide the league structure for both sets of divisions. League Secretary, Andy Price, reported at the League's AGM that he made significant progress in the possibility of introducing an on line results system, whereby teams could send their results in electronically. It was hoped that this new system would be ready for use in the 2014 season. Sixteen players competed in the Terry Croft competition held at Reman Services on Sunday 13 October 2013. Ant Price of Ford beat fellow club mate Geoff Davies to win the trophy. On the way he beat Reman Sentinel's Dan Ashley, Craven Arms Nathan Baker and Mike Haycocks of Frankwell. Meanwhile Geoff accounted for Unison's Alan Everall, Elephant & Castle's Rich Leah and Prince Hotel's Dave Pugh. League President, Barry Jennings, is taking entries for this popular competition. Total Prize money is £4240, with a First Prize of £1200. Entry is £15 and limited to the first 256. Qualifying dates are 22, 23, 29 and 30 March, 2014 with sessions at 10.30, 11.15, 13.00 and 14.00. Finals Day is Sunday 6th April, 2014 with an 11.30 a.m. start. All entries to Barry at 197 Monkmoor Road, Shrewsbury, SY2 5BQ (01743 351155). Eight teams entered the one day charity competition and £300 was raised for the Severn Hospice. Prince Hotel B were the winners, beating Prince Hotel A by the narrowest margins of one chalk. 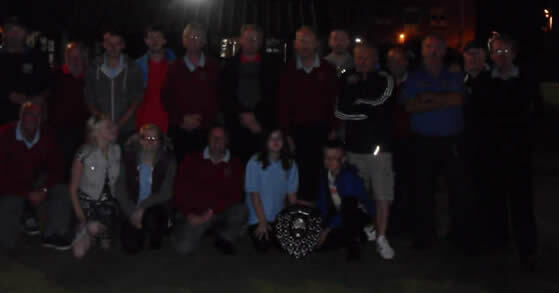 County President, John Hughes, presented the trophy to the Prince B team and is pictured below with both teams. The Tanners Shropshire League retained the Dave Ellis Challange Shield, which was last contested in 2011, by beating the Mid Shropshire League by 31. The home leg played at Telepost was lost by six chalks but the away team won at Shifnal by 37 chalks. A raffle was held at Telepost and £87 raised which has been donated to Mark Shore's appeal for the Meningitis Trust. The Charity One Day Competition will be held on Sunday 22 September at 10 a.m. Qualifying Group matches will be played at Severnside and the finals at Telepost. Teams should consist of five players with four playing in each game. This competition is only open to players regsitered with the Tanners Shropshire Bowling League. Entry fee is £5, all of which will go to a very worthy charity, and entries can be made on the day of the competition. The popular Charity Challenge match in memory of Dave Ellis between the Tanners Shropshire League and the Molson Coors Mid Shropshire League will take place at two venues on Saturday 21 September (6.30 p.m.). The home venue is Telepost and the away venue, Shifnal. Players from across all divisions of the two leagues have been selected for these representative honours. Reman Sentinel were comfortable winners of the Tanner Cup as they beat Battlefield by 41 chalks at Bicton. The Sentinel raced into a 41 chalk lead with four winners, led by Dan Ashley with 21-7. It did not get any better for Battlefield in the middle as Dave Beer was their only winner, 21-15. The Sentinel had two more winners at the back with another card of 21-7, this time from Ian Marshall. The Lions picked up the last two games to round off the evening. The Trophy was presented by Steve Lloyd of League Sponsors Tanners Wines to Sentinel Vice Captain James Mammone, with captian Bob Chandler letting him take the plaudits. Keith Owen, Battlefield captain, collected the Consolation Trophy. Crescent were the winners of the Champagne Cup, beating the Corbet Arms by 89 chalks. Crescent A were also winners of the Scadding Cup beating Old Shrewsbury B by one chalk, with games tied at 5-5. Ford A beat Castlefields A in the Fullwood Cup, again 5-5 on games and 11 on the aggregate. In the Team Doubles, Prince Hotel beat Castlefields to win the main competition and in the Consolation Ford beat Reman. The Tanner Cup Final is on Saturday 14 September 2013 at Bicton when Battlefield play Reman Sentinel. The Fixtures Secretary is on holiday this week so it is not possible to update the aggregates and league tables for the Friday Night league. However, results from last Friday are shown below and provsional tables based on these scores are shown on the relevant Result pages of this Website. It is not possible to update the website with last week's results and the latest tables due to the Fixture Secretary having an IT problem. As soon as this is resolved and the data received the site will be updated, hopefully by Thursday 8th August. Chris Kelly and Geoff Davies from the Tanners Shropshire League club, Ford, beat Andy Walker (Prince Hotel) and Neil Ashley (Castlefields) 21-9 in the final of the Terry and June Doubles Competion held at the Prince Hotel on Sunday 4 August. In the semi finals they just beat Jamie Morgan and Chris Wilson of the Prince Social 21-19. The other semi final was even closer with Walker and Ashley just edging out Derek Jones and John Griffiths from Reman Sentinel. From left to right: John Griffiths, Derek Jones, Andy Walker, Neil Ashley, Mike Caddick (Chairman and Referee), Chris Kelly, Geoff Davies, Jamie Morgan and Chris Wilson. Due to it being necessary to have a Preliminary Round in the Consolation Trophy the semif finals of both Team Doubles competitions will be played on 29 August and the finals on 5 September. Captains are asked to note that they must put individuals' handicaps by their names on the Match Sheet and not just totalled up at the bottom of the form. This will allow for other captains to confirm handicaps. These matches to be played on Wednesday 24th July. These m atches to be played on Wednesday 31st July. There will be referees provided for all these games. The First Round of the competition will be played on 25th July. A final reminder that the closing date for entries is this Saturday, 22nd June 2013 and should be given to the Competitions Secretary, Barry Jennings on 01743 351155. Matches to be played on 3rd July. Draw made by the SCGBA Green Selection Committee on 6 June. The first round of the Team Doubles competition will be played on 4th July and entries are invited by the 22nd June 2013 to the Competitions Secretary, Barry Jennings on 01743 351155. The Qualifiers for this year's Youth Doubles will take place on 20 June with the finals, subject to the number of entries, taking place the following Thursday evening, 27 June. The provisional venue is Telepost for both dates. Entries to Competitions Secretary, Barry Jennings on 01743 351155. Ties to be played Wednesday 29th May. The draw was made by Paul Adams. At the League Executive Meeting held on 16 May 2013 suggestions from the Management Committee were put forward for clubs to consider with a view to the matter being fully debated at the next League Executive Meeting on 18 July 2013. The Management Committee had previously met to consider a wide range of issues raised by clubs over recent seasons as they have increasingly struggled to raise full sides for a number of reasons, resulting in the withdrawal of several teams/clubs. The divisions on a Tuesday would no longer be called Reserves, to reflect the reality of the situation that very few clubs operate those teams in such a way. It would be renamed the Tanners Shrewsbury League and only entries from clubs within a ten mile radius of Shrewsbury would be admitted. This would not effect exisiting clubs outside the radius who would continue as members. It would not be necessary to have a team in the Friday League to enter the Tuesday League and as now clubs can have more than one team (in such a case the current Reserve Team rules regarding registering specific players would remain). Any Premier League player who has played more than three Premier games would not be able to play for the remainder of the season in this League, otherwise no other player restrictions would apply. As per existing rules any club entering a team must have a minimum of 12 players registered. This would continue to be known as the Tanner Shropshire Bowling League and would be 12 a side with no requirement for a Registered 6. Clubs can, as now, have more than one team but each side must have its own identity and squad of players. Teams must have a minimum of 14 registered players. No changes are proposed to the Tanner/Champagne and Fullwood/Scadding Rules. e.g. First Reserves = First Division of Tuesday Night League. Graeme Wornell of the Prince Hotel was winner of the League Merit played at Severnside beating Dave Peach of Castlefields 21-5. The losing semi finalists were Adam Jones of Castlefields and Doug Edwards of POWBC. 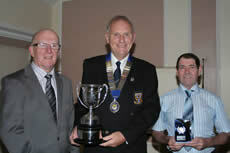 The trophies were presented by County President John Hughes. Byes: Bagley A, Bicton Village, Castlefields A, Unison A, Reman Sentinel, Prince Hotel, Meole Brace A, POWBC B, Hanwood and Ford A.
Byes: Castlefields B, Elephant and Castle, Ford B, Greenfields Social A, Meole Brace B, Monkmoor, New Hanwood, OSBC B, Pontesbury C and Telepost A. The Fixtures Lists will be available on this site shortly and have been distributed to all clubs. In the meantime copies are available by email to this site. At the AGM it was reported that Bromfield had resigned from the league. It was agreed that Division One would comprise 13 teams and the remaining three divisions twelve teams. This means that Hadnall avoid relegation from Division Three. Fixtures are due to be released at the next Executive Meeting on 21 February 2013. The Reserve League will start on Tuesday 2 April and the First Teams on Friday 5 April 2013. The proposal to reduce the Friday teams to ten a side was defeated by a sizeable majority, with only five delegates voting in favour. The second rule change relating to playing two games on the same fixture night was agreed. The Annual General Meeting of the League will be held at the Bagley Bowling Club on Friday 1st February 2013 at 7 p.m.
Change to Rule 8A, proposed by Dorrington and seconded by Wem USC, to the effect that all teams in the Tanners Shropshire Leagues on Friday evenings shall consist of ten players (rather than 12 as at present). Change to Rule 8R, proposed by the Fixture Secretary and seconded by the Executive Committee, that no player shall be permitted to play two matches in the Tanners Shropshire League on the same fixture night. All clubs are entitled to send a representative and a delegate to the meeting, however, voting is restricted to one vote per club. The voting in of any change or alteration to a rule must be at least twice the amount for as against. on Saturday 27th October and below are photos from the occasion. David Payne (Hanwood) and Champagne Cup to Steve Walker (Castlefields). Ford team that won Charity One Day Cup. Pete Mackay (Division Four Aggregate winner - Monkmoor). 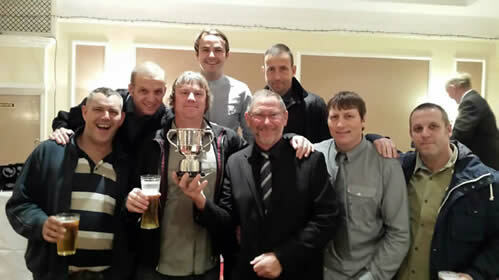 Division Two champions) and Jack Dale of the Prince Hotel who won the Fullwood Cup. Roberts and Neil Jones from Reserve Division Four winners, Bricklayers B. Chairman, Mike Caddick, and League Secretary, Andy Price, presented a cheque for £200 to the Severn Hospice on behalf of the Tanners Claret Shropshire Bowling League following the successful Charity Team One Day event held in September. Individual Club Aggregates are now available on this website - see Aggregates Tab and select dvision. Any body who has won a Tanners League trophy this year is requested to take it the Trophy Centre in Milk Street, Shrewsbury as soon as possible so that it can be engraved and be ready for the Presentation night on Saturday 27th October. The Annual Dinner and Presentation Evening will take place at the Lord Hill Hotel, Shrewsbury on Saturday 27th October 2012 at 7 p.m. Tickets are available priced £22 from Andy Price (01743 851117). The presentation of the sponsorship cheque from TANNERS WINES to the Tanners Shropshire Bowling League following another successful season. The Cornerman articles have not been published in this week's Shrewsbury Chronicle as they did not have enough space due to adverts. Part of the reports have been published on their website at ://www.shrewsburychronicle.com/section/sport/. The Charity Team Fours competition was won by Ford B who beat Prince Hotel A in the final by the slenderest of margins on the Telepost Number One Green. Semi Finalists were Castlefields and Prince Hotel B. Other clubs supporting the event, which was kindly sponsored by Rob Jones, were Bicton, Corbet Arms, Crescent, Minsterley, Old Shrewsbury, POWBC, Sinclair and Telepost. £200 was raised and this will be donated to the Severn Hospice. 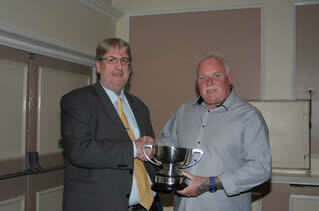 Barry Jennings, Competition Secretary, presents the Charity Team Fours Trophy to Ford B Captain, Danny Wornell. The Annual Dinner and Presentation Evening will take place at the Lord Hill Hotel, Shrewsbury on Saturday 27th October 2012 at 7 p.m. Tickets are available on a first come, first served basis from Andy Price (01743 851117). Mr Steve Lloyd of Tanners Wines will be presenting the sponsorship cheque prior to the League Executive Meeting on Thursday 20 September at Bagley BC (approx. 7 pm - 7.15 pm). All league delegates are invited to join the presentation for a photograph. 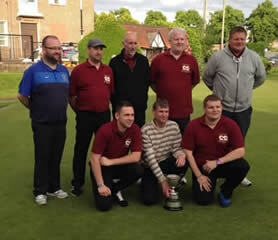 Castlefields beat Ford on Meole Brace Number 1 Green to win the Tanner Cup by 47 chalks. Man of the Match was Ben McCormick, with a 21-6 card. Castlefields' captain, Steve Walker, with the Tanner Cup. Ford Captain, Chris Kelly, pictured with the Dr. Ireland Cup. Hanwood won the Champagne Cup by beating Reman Sentinel 32 chalks in the final played at Castlefields No. 2. 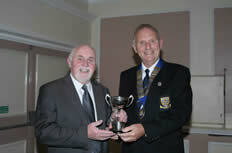 Hanwood Captain, Dave Burton, pictured with Competition Secretary Barry Jennings. Prince Hotel beat Ford 6-4 and by 17 on aggregate in the Fullwood Cup Final played on the Fullwood (No. 3) Green at Severnside Bowling Club. 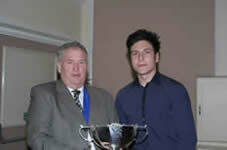 Jack Dale, Captain of the Prince Hotel pictured with League Secretary Andy Price. The Prince Hotel were the winners of the Team Doubles Competition beating the POWBC by 43 chalks on OSBC No.1. On the No. 2 green Bicton beat Meole Brace in the Consolation Competition by 33 chalks. 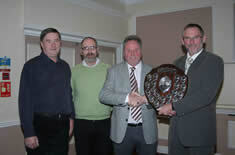 County President Geooff Balshaw presents the Team Doubles Shield to the Prince's captain, Chris Wilson. The four a side Charity Team event will take place on various greens on Sunday 23 September. Team squads should consist of five players and entry is £5 per team. Entries to Barry Jennings (01743 351155) by Sunday 2nd September. The Frank and Mabel Edwards Mixed Doubles competition will be played on the Bagley and Greenfields greens on Sunday 16 September. Entry is £5 per pair - please contact Barry Jennings to enter. 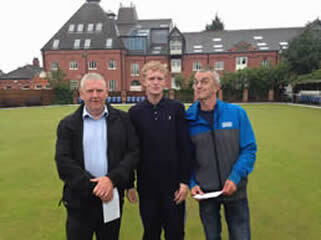 Wayne Phillips of Hanwood was the winner of the 2012 League Handicap on Bank Holiday Monday overcoming a field of 32 bowlers. In the semi final he beat Ford's Graham Turner 21-6 before winning 21-13 against Monkmoor's Lesley Medlicott, who in the other semi final, had beaten James Mansell from New Hanwood 21-12. 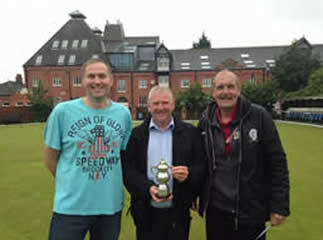 Pictured above are Lesley Medlicott, Referee Derek Jones and Wayne Phillips with the League Handicapp Trophy. The Fixtures Secretary is on holiday this week so no league tables or results from Friday 17th August are available at the moment to put on this site. It has not been possible to update the Reserve Leagues' information following last week's games due to an ongoing problem with the Fixture Secretary's computer. As soon as they are available they will be updated. Please note that it has not been possible to put the results from Friday 20 July 2012 onto the website due to a problem with the Fixture Secretary's computer. As soon as this is addressed they will be placed on the website; hopefully before the games on Friday 27 July. Please note that it has not been possible to publish the results or league tables following last week's games as the Fixture Secretary has a problem with his computer. As soon as this is resolved the results page will be updated. Due to there being no post over the Jubilee Bank Holiday the majority of results have yet be received by the Fixtures Secretary. It is anticpated that the league tables will be available by Thursday evening and once they are this website will be updated with the results from last Friday, league tables and leading aggregate players. Wayne Rogers of Burway won the League Merit for the second year in succession beating Anthony Gray from Pontesbury 21-13 on Bank Holiday Monday. This was the third time Wayne has won title, having also won it in 2004. In the semi finals he overcame Ash Wellings of Hanwood 21-8, whilst Anthony beat Castlefields' Andrew Judson 21-20. Byes: Pontesbury A, Bricklayers A, Castlefields B, Minsterley, Prince Social, Bayston Hill A, Ford B, Bagley B, Greenfields Social A and Monkmoor. POWBC B have been disqualified for failing to turn up. All bowlers are advised that there will be no shelter available at Oxon until about the end of May. 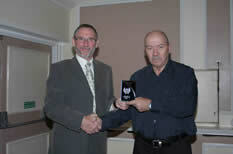 Retiring League President, Tony Gibbons, congratulates his successor, Barry Jennings on his appointment. Fixtures for 2012 were handed to each Clubs' delegates at the League Meeting held on 23 February 2012 and will shortly be available on this website. The Reserve Divisions start on Tuesday 3 April and the First Teams on Friday 6 April 2012. In the meantime a full set of fixtures can be obtained by emailing information@shropshirebowlingleague.org. Division One - Battlefield v Craven Arms, Burway v Hanwood, Castlefields v Meole Brace, Reman Sentinel v Prince Hotel, George v. Bricklayers, Telepost v Ludlow Castle. Division Two - POWBC v Wem BC, Ford v Reman Services, Oxon v Unison, Crescent v Whittington, Corbet Arms v OSBC. Division Three - Prince Social v Wem USC, Church v Bicton, Bagley v Bromfield, Bishops Castle v Preston Brockhurst, Frankwell v Bayston Hill. Division Four - Dorrington v. Minsterley, Monkmoor v Worthen & Brockton, Bicton Village v St Oswalds, Greenfields Social v Oxon Village, New Hanwood v Weston Rhyn, Baschurch v Sporting Telepost. The AGM will be held at the Bagley Bowling Club on Friday 3rd February 2012 at 7 p.m. There is one new team in the Reserve Divisions- Castlefields C.
(a)The finalists must notify the Competition Secretary or other nominated official of the League at least seven days before the Finals date the names in playing order of their teams and reserves. Clubs that play in the Premier League and Shropshire League must, in addition to the players registered at Rule 8Q, register twelve other players, all of whom must play regularly in the Premier League team. Those players will also be eligible to play in the Shropshire League. A club must notify the Match Secretary within two days of the start of the season of the registered twelve and may alter the list on notification to the Match Secretary. Players registered under this rule cannot play in the Reserve Division. Once a player has played in the Premier League on three occasions in any one season, he will not be eligible to play in Reserve team League and Cup competitions for the remainder of the season. Each team will play home and away matches with all other teams in the same division. First teams in Division One and Two to consist of twelve players, first Teams in Divisions Three and Four to consist of ten players. The remainder of 8A to remain the same. Castlefields were only 14 up after the first four with Kev Walker, Luke Jones and Dave Peach all winning. Den Walton had a good game winning 21-10. The middle four saw Mick Pritchard, Mick Thomas and Mark Parsons all winners. Pontesbury's winner was Karl Jones with a narrow 21-19 victory. The Frank & Mabel Mixed Doubles is on Sunday 25th September at Severnside 10.30am start. Entries will be taken up until 10.15 on the day or you can pre-book by phoning Anthony Price on 01743 851117. 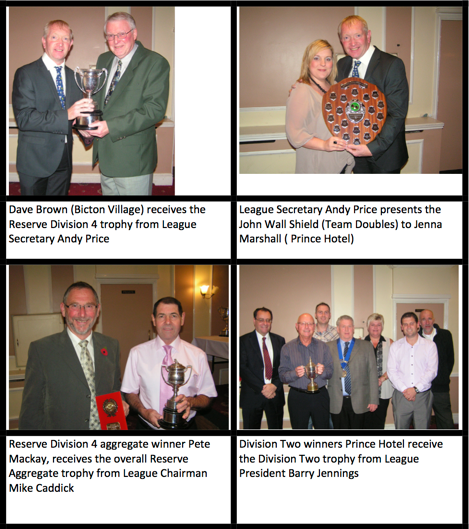 The League Handicap returned to Prince Hotel for the fourth year running but not with the same winner. Danny Wornell came out on top of the 54 entries at Severnside. He defeated League Merit winner Wayne Rogers 21-12 in the Final after Rogers had defeated 3 time winner Gary Neal. It was a great day of bowling with a strong field again showing the quality of the Tanners League. The Main Team Doubles competition was won by Bricklayers who comfortably beat Unison on Severnside No. 2. On the No. 1 green, the Consolation shield was won by Ford who narrowly overcame Meole Brace. Forthcoming dates: Champagne Cup Final between Pontesbury and Castlefields at Bicton this Saturday 10th September 6.30pm start. Tanner Cup Final is on Saturday 17th September at Meole Brace No. 1, Ford versus Burway. 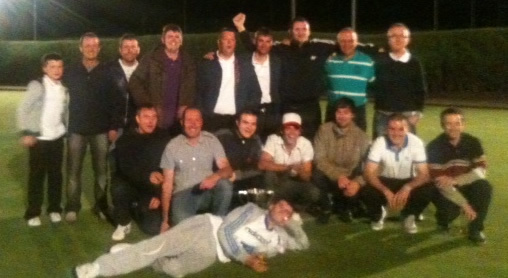 The Scadding Cup was won by Hanwood who beat Corbet Arms 6-4 at Telepost. POWBC C were winners of the Fullwood Cup over the Prince Hotel in keenly fought final on the Fullwood Green at Severnside. The humpers went on from 3-3 to win 7-3 overall and by 34 chalks. The semi final match between Reman Sentinel and Meole Brace will now be played at POWBC No. 2 on Thursday 18 August. The Scadding Cup Final will be held on 20 August at Meole Brace No. 1 between Hanwood and Corbet Arms. The Fullwood Cup Final is at Severnside No. 3 on 3 September and will be played between POWBC and the Prince Hotel. Matches to be played on 24 August. In the Team Doubles main competition Unison will play POWBC at Ford and Bricklayers v. OSBC at Reman. 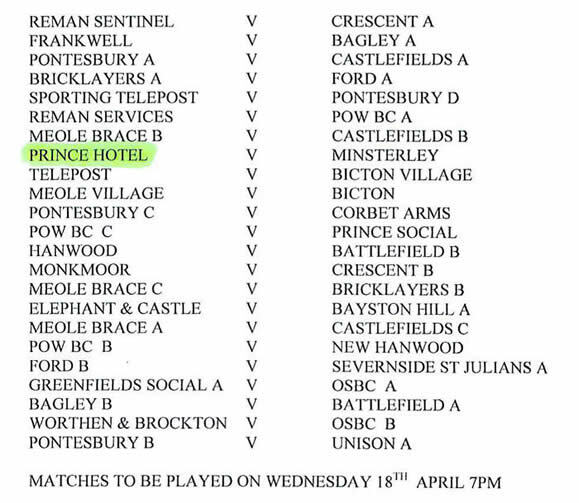 In the Consolation Prince Hotel play Fprd at Bicton and Meole Brace play Reman Sentinel at Prince Hotel (venue changed - see above) . Matches to be played on 18 August. The one day team competition in aid of local charities and sponsored by My com takes place on Saturday 2 July 2011 at various greens in Shrewsbury. Teams should consist of five players, four of which will play in each match. Teams will be placed in groups with a handicap system in place.The group winners will go through to the finals, which will be held at Severnside BC. Entries to Anthony Price on 01743 851117. Ben McCormick of Pontesbury was the winner of the 2011 Harold Kaye competition, overcoming Telepost's Adam Rogers 21-11 in the final. In the semi final Ben beat Hanwood's Dan Williams 21-9 and Adam beat Old Shrewsbury's Jodie Walton 21-13. 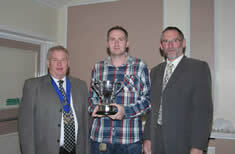 The 2011Harold Kaye Trophy winner Ben McComick pictured with Anthony Price and Mike Caddick. Adam Rogers (Telepost), Anthony Price (Competitions Secretary), Jodie Walton (OSBC), Dan Williams (Hanwood), Ben McCormick (Pontesbury) and Mike Caddick (League Chairman and Referee) line up befor the start of the semi finals. There are byes for Meole Brace A, Battlefield B, Crescent B, POWBC B, St Julians A, Bricklayers A, Reman Sentinel, Telepost A and Bicton. Byes: Meole Brace C, Pontesbury C, Bricklayers B, Worthen and Brockton A, Prince Social, Minsterley, POWBC A, Bagley A & B, Corbet Arms and New Hanwood. 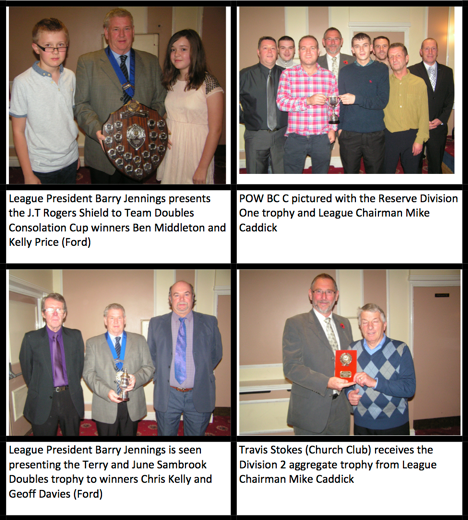 The fixtures were released at the League Executive Meeting held on 24 February 2011 at the Bagley BC. Divisions One and Three start on 1 April 2011 as previously reported. However, the Fixtures Secretaries have done a great job in arranging Divisions Two and Four so there are no byes and there is a free week for all teams in those divisions on 1 July (apart from Wem USC who entertain Meole Brace on that date). As a consequence Divisions Two and Four start two weeks later on 15 April and finish a week earlier on 16 September 2011. Late withdrawals from the Reserve Divisions are Bricklayers B and Greenfields D from the Fourth Reserve Division. A serious doubt remains about the Severnside team in the Third Division (Friday). The one day four a side charity competition, sponsored by MyCom, has been moved from Saturday 18 June to Saturday 2 July 2011 to avoid a clash with the Victorian Olympics event in the Quarry. The above format was agreed following the withdrawal of Royal Mail, Harlescott and Atcham Malthouse plus the readmittance of Preston Brockhurst. There remains serious doubt whether Severnside will be able to field a side, hence the reason for the 3rd Division to have 13 teams, which would mean that if they withdraw the 3rd Division would also consist of 12 teams. The reserve leagues will change to a four division format following the withdrawal of several teams and there remains the possibility or two more may follow. New League Chairman is Mike Caddick and new Competition Secretary is Anthony Price. It was also agreed that the Floodlight competition would not be held and instead a one day four a side competition will be held on Saturday 18 June 2011. Mycom have offered to sponsor the competition, which will also be used as a charity event. Details of the format of the competition will be agreed at the next League Meeting in March. A League Executive meeting was held on 13 January 2011 where the resignations of Harlescott and Royal Mail first and reserve teams were sadly announced. Atcham Malthouse have also withdrawn their reserve team and there was a strong possibility that Monkmoor B would resign. As it currently stands there are 51 Friday teams and 55 reserve teams. There will be a proposal at the AGM on Friday 28 January 2011 to revert to four reserve divisions, given the recent withdrawals from the reserve divisions.